Aerzener Maschinenfabrik, Aerzen, Germany, has recently introduced the Alpha Blower large blower series. Thanks to 104 model variants, it provides a high degree of flexibility for multiple customer applications. It is always the right size! 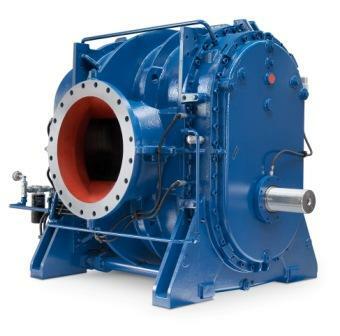 AERZEN large blowers are positive displacement blowers which can be applied virtually anywhere. They can attain volume flows of up to 77,000m³/h at a maximum overpressure of 1000 mbar and a maximum negative pressure of - 800 mbar. These blowers are used in the cement, foodstuff and chemical industries for pneumatic conveying of bulk material, as well as for production of gases and oxygen. With the Alpha Blower the company aims to provide a new level of efficiency and flexibility. It is now possible to refer to a type variation of 26 machines with only four different profile sizes owing to the length modification of the cylinder. Furthermore, customers can select from a range of two and three-lobe rotors, as well as horizontal and vertical conveying directions, depending on the field of application and installation site. This increases the variety of models of Alpha Blower to 104 variants in total.